The legendary Atlantis Megabrunch is returning in December… and they’re planning the ultimate Christmas bash to kickstart the festive season! We’re talking four hours of unlimited drinks and eats across 9 venues, including Nobu, Gordon Ramsay’s Bread Street Kitchen & Bar, and the iconic underwater restaurant Ossiano — ready to jingle your way to an epic night brunch?! Enjoy some of the city’s top restaurants… in one night! 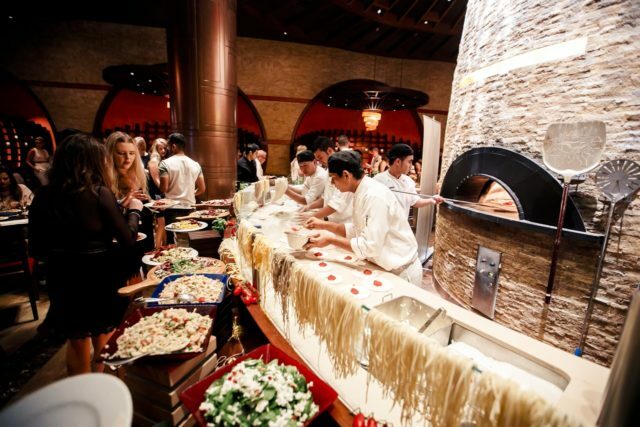 Nobu Dubai: They’ll be serving up everything from sushi to signatures like Nobu tacos, yellow tail sushi jalapeno, black cod butter lettuce and beef tenderloin anticucho, along with an awesome selection of sakes. Hakkasan Dubai: Add a Cantonese culinary twist to the festivities with Hakkasan’s incredible menu of signature dishes, as well as a selection of dishes that you’ll only find in Dubai. Bread Street Kitchen & Bar: This will be one of the top spots of the night, with British favourites on showcase at Gordon Ramsay’s famous restaurant, including mini turkey Wellington, truffle mac and cheese fritters with chestnuts, veal and fennel sausage rolls, mulled wine cured Scottish salmon and more. Ronda Locatelli: Get an authentic taste of Italy at Ronda Locatelli, where you’ll find foodie favorites like truffle risotto, baby spinach salad, homemade ravioli and caserecce pasta with duck ragu. Did we mention this will be the unofficial pizza headquarters for the night?! Seafire Steakhouse and Bar: Take your pick from the live cooking stations serving roast turkey, a beef carvery, short rib donuts, along with a seafood Martini bar and a five-piece jazz band providing entertainment. This is an amazing opportunity to dine inside The Lost Chambers Aquarium, which will be the dessert epicenter for the night. They’ll be featuring a range of live cooking stations serving caramelized Smore marshmallows, French croissant toast and, wait for it, smoked nitro popcorn! If you’ve got a sweet tooth, there’s even a ‘freaky shake paradise’ on offer, along with a designated chocolate praline and roasted chestnuts station… we might be here all night! 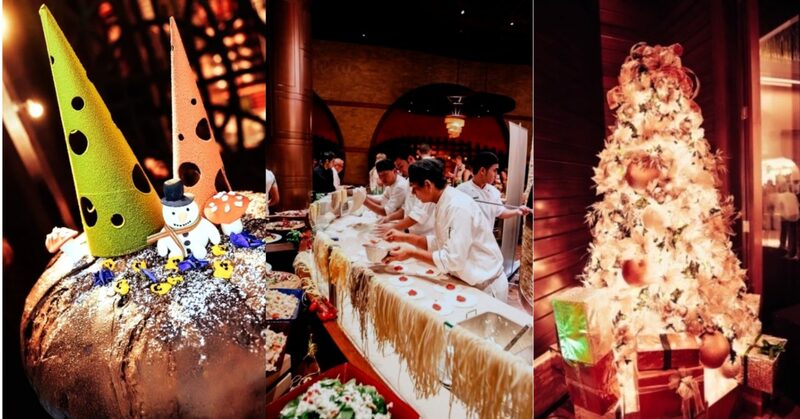 The Cirque de Cuisine night brunch at Atlantis runs from 7pm-11pm, but that doesn’t mean the festivities end there. Bread Street Kitchen & Bar will be hosting the official after-party from 11pm-3am, where resident DJs will be playing all your favorite Christmas classics…. ohhh yeah! Cost: AED 535 per person; AED 335 for teens (aged 12-20). Tickets are available from Platinum List. 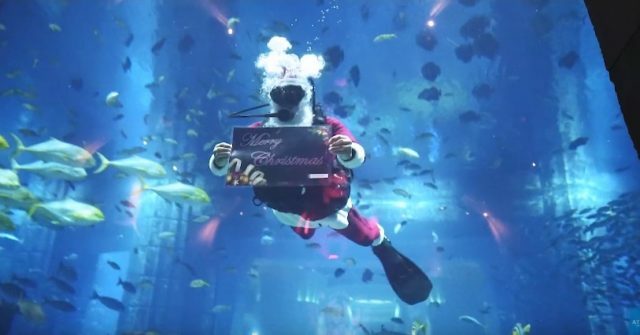 Don’t miss Dubai’s biggest Christmas bash… and the chance to hang with Santa at Atlantis! For reservations, call +971 4 426 2626 or email restaurantreservations@atlantisthepalm.com. previousYou Need to Try this Chocolate Trivia Challenge at Your Next Game Night!